Stuffed Squid in Oyster Hoisin Sauce. Here is another kitchen experiment I just made for lunch today and I want to share to everyone. This one is fairly moderate to prepare in the sense that it involves stages of preparation and cooking, not to mention the time and effort in cleaning the squid. For the recipe I used small to medium size squid, I would have preferred the use of larger size squid but I’m afraid the stuffing might not be properly cooked. The squid should be thoroughly clean including removal of the skin membrane, all the innards was discarded but the head and tentacles are reserved. For the stuffing I used finely diced pork coarsely ground pork may be used, finely diced bacons for flavors, finely diced shrimp I used a lot and frozen mixed vegetables I used the regular ones but you may choose you on combination if you prefer fresh vegies. I have to sauté the stuffing with garlic and onion before actually stuffing them to the squid cavity for the reason that squid will be cook as short as possible, overcooked squids are rubbery. The sauce is made up as the name suggests oyster sauce and hoisin sauce with garlic and ginger topped with diced bell pepper and onion. 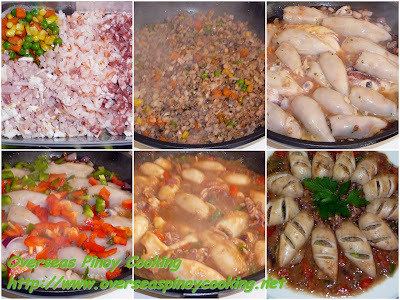 Okey here is the recipe of my kitchen experiment Stuffed Squid in Oyster Hoisin Sauce, try it. To clean the squid, pull out the head and the innards will come out with it. Discard ink sacks entrails and remove teeth, keep the head and tentacles. Remove the plastic like backbone and outer skin membrane, wash out entrails, wash squid and drain, keep aside. 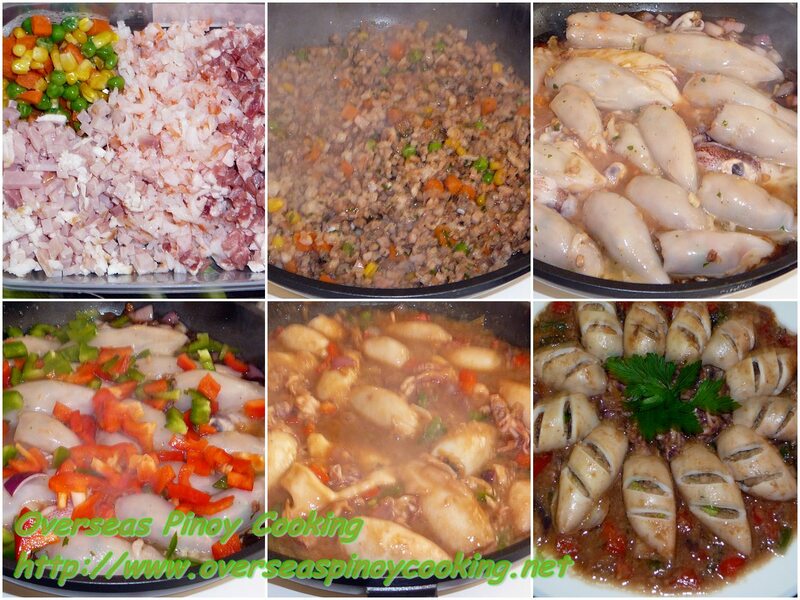 To cook the stuffing, In a wok sauté garlic and onion until fragrant. Add in the bacon and parsley, stir cook for 1 to 2 minutes. Add in the pork and stir cook for 2 to 3 minutes then add in the soy sauce, salt and pepper to taste continue to stir cook for 2 to 3 minutes. Add in the mixed vegetables and shrimp, stir cook for 2 to 3 minutes or until it dries up. Remove from wok and let cool down. To assemble, add in the beaten egg and cornstarch over the cooked stuffing mix until well blended. Using a spoon scope some stuffing and fill the squid cavity, do not overfill. To braise the stuffed squid, heat the same wok until smoke start to come out, add in generous amount of oil and let heat up. Add in the ginger and garlic and stir cook until fragrant, add in the onion and stir cook for about half minute. Add in the oyster sauce, hoisin sauce and 1/2 cup of water, stir cook for about a minute. Add in the squid head and tentacles then on top of it arrange the stuffed squid including the juices that have drip. Let simmer for 1 to 1 1/2 minutes do not stir to let the stuffing set, then turn over each squid add in the bell pepper and continue to simmer for a minute, at this point the stuffing should have set. Stir to even out the cooking and let the squid fully coated with the sauce, correct saltines if required and cook for another minute or until the squid is just cook, before removing from the wok garnish with parsley or spring onion. To serve, using a sharp knife cut each stuffed squid a couple of diagonal slit, keep aside. Separate the squid heads and pour the sauce over a large platter, arrange the stuffed squid and head, garnish with parsley for presentation.